068. SIR E.H. SHACKLETON. Issued F. & J. Smith's Cigarettes. (1911). Card number 48 from a set of 50 entitled "Famous Explorers." Size: Ca. 2.65" x 1.4". Recto: View of ship (Nimrod?) 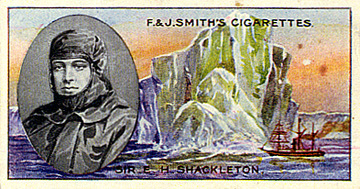 beside a large iceberg, inset portrait of Shackleton in polar clothing. Top: F. & J. SMITH'S CIGARETTES. Bottom: SIR E.H. SHACKLETON.